I got up early so I wouldn’t miss any of the commentary of “Breakfast at Wimbledon” in preparation for the matchup between the two greats, Novak Djokovic (No. 1 Seed) and Roger Federer (No. 2 Seed.) I have been cheering for Roger Federer throughout the tournament despite friends telling me “he’s over the hill,”, “past his prime” and “on his way out.” I believe in him — his graceful strokes, his strong serve and his positive attitude. I like his opponent, too — he’s determined, resilient and a brilliant shot-maker. 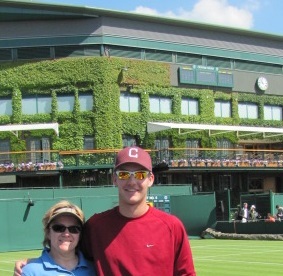 Bev Benda and her son, Nick Moe, at Wimbledon. How does one feel at Wimbledon? “Breakfast at Wimbledon” — scrambled-up eggs with garden kale, basil and cilantro, added toast with jam, red grapes and dark roast coffee. “Breakfast at Wimbledon” has been a family tradition since I was 15. It doesn’t require strawberries, just china. 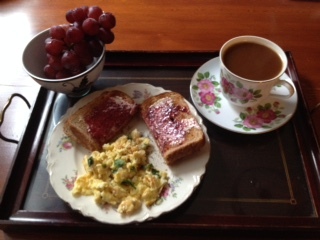 Today, I made scrambled-up eggs with garden kale, basil and cilantro, added toast with jam, red grapes and dark roast coffee, all served with fine china on an antique tea tray. Delicious company to my memories. 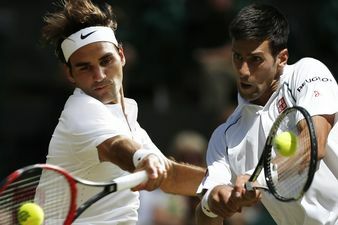 When the match started, I was focused on the beauty of two amazing players who gave their all in four incredible sets. They call it the Gentleman’s Final. And it was truly that. In the final game, in what could have been a challenge point, Federer didn’t flinch, just let the point go to Djokovic, who then won, 7-6, 6-7, 6-4, 6-3. In the post-match interview, they both praised each other for a well-played match. Federer made no excuses for his loss, just gave high praise to the opponent who beat him. And Djokovic, instead of gloating over his win, praised Federer for being the champion he is. Both expressed gratitude to organizers, fans, their teams and families. The commentators noted before the match that Federer wanted his two sets of twins there for the trophy presentation. His girls are 6, and the boys are 1. It was important to him that they experience it, whether he won or lost. What his children would see is that their father is not just a great tennis player loved by the crowd but a great athlete who is a gracious sportsman. What a great legacy to pass on to his children! Gentleman’s Final. Yes, it surely was.